HCM CITY (VNS) — Truong Thi Ut from Binh Chanh District faced a dreadful dilemma. Should she give birth to her six-months old, unborn son if he had a cleft lip, as ultra sound images revealed? Ut decided that the problems facing her boy would be enormous, so she went to Tu Du Obstetrics Hospital in District 1 for a termination procedure. However, when she arrived, a doctor advised her to seek final advice from Paediatric Hospital No.1, which specialises in surgery for cleft lips and palates. There, Ut met Dr Nguyen Van Dau, the head of the ward, who persuaded her not to give up her baby. "I forever remember what he said", she said. "He said I should focus on delivering my baby and that he would take the responsibility for fixing my little boy up." He added that the baby was fully formed, apart from his lip, and had a right to be born, she added. "Dau's encouragement changed my thinking." Three months after the boy was born, cosmetic surgery was performed to repair his cleft lip and palate. "It gives me so much happiness to look at my son's repaired lip," Ut said. Tran Thi Hai Huyen of District 12 also had concerns when she was told her son would be born with a cleft lip. The image of her deformed son tormented Huyen day and night, so she started doing research online. On internet forums, she discovered the odonto-stomatology ward at the Paediatrics Hospital No.1and went there to discuss surgery. Some mothers told Dr. Dau that they were discriminated against by their parents or parents-in-law for giving birth to a child with a cleft lip, implying that the mothers were in some way responsible. There have even been cases of couples divorcing over the issue. 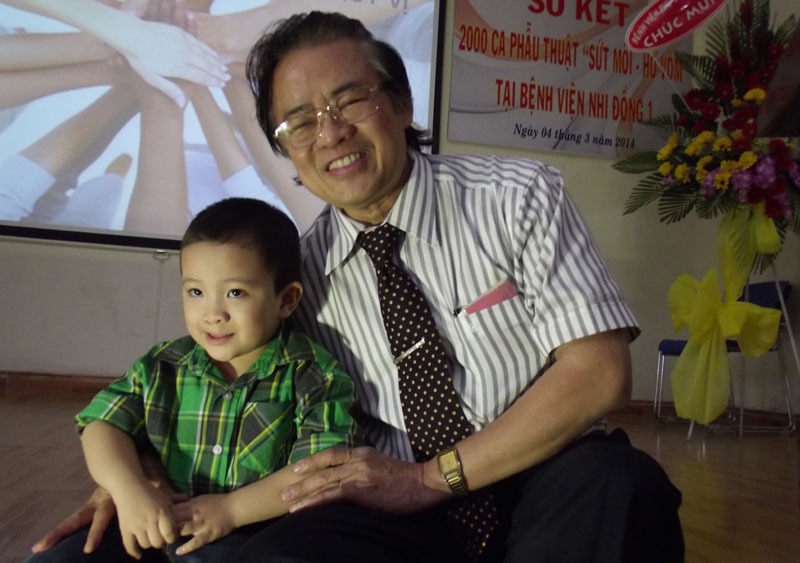 Dau said that cleft lips and palates were common in many countries, including Viet Nam. According to the survey conducted by doctors at Tu Du and Hung Vuong obstetrics hospitals, from 2000 to 2005, one out of every 700 babies in Viet Nam was born with a cleft lip or palate. There are many reasons for babies developing cleft palates, including genetic factors, environmental elements and medications taken by the mother. However, if treated, most babies with the defects make a full recovery, according to Dau. Due to lack of money and awareness, especially in rural and mountain regions, babies often receive treatment late - or not at all, he added. Untreated children are often looked on as social outcasts, finding it difficult to get a job or to get married, but Dau said children as old as 16 could be successfully treated. Dr Dang Hoang Son, head of Paediatric Hospital No.1's Ear, Nose and Throat Ward, added that if babies with cleft palates receive treatment early, they would learn to eat and speak well.